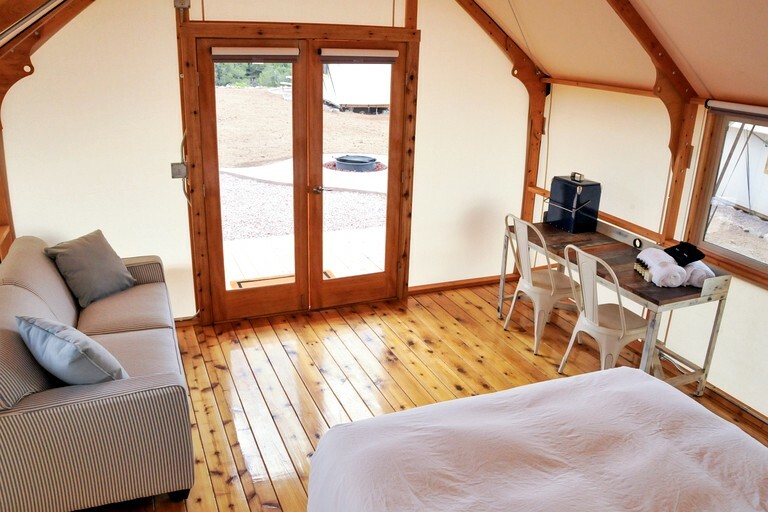 Guests will discover a unique experience with these stunning canvas glamping tent cabins. 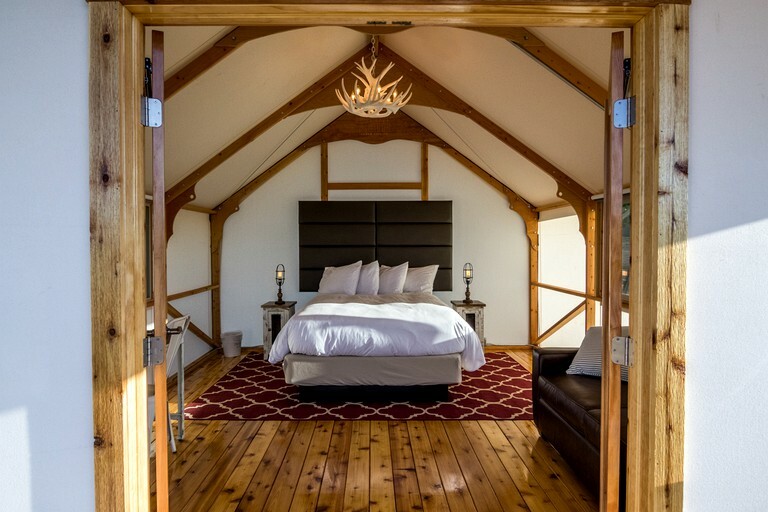 Furnished to exquisite standards with French doors, a luxury queen-size bed, a double sleeper sofa, electricity, and Wi-Fi for guests to stay connected, guests will feel right at home with these creature comforts. 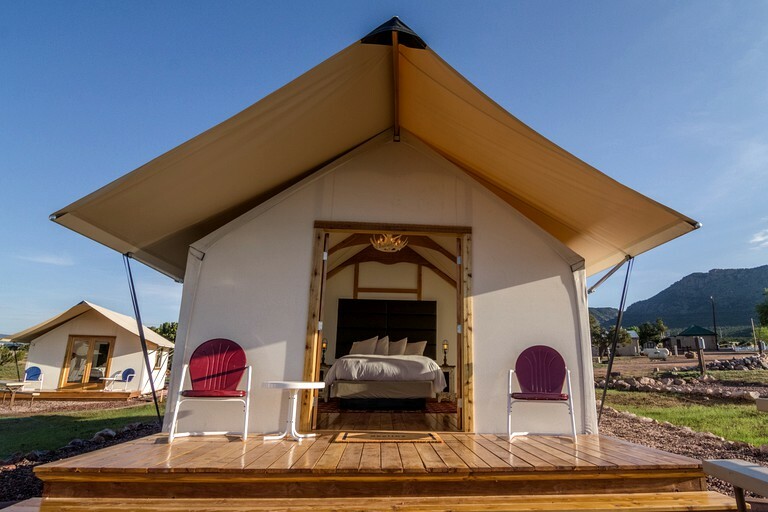 The glamping tent cabins comfortably accommodate up to four guests and boast a retro steel cooler and a complimentary bag of ice for the first beers of the adventurous getaway. 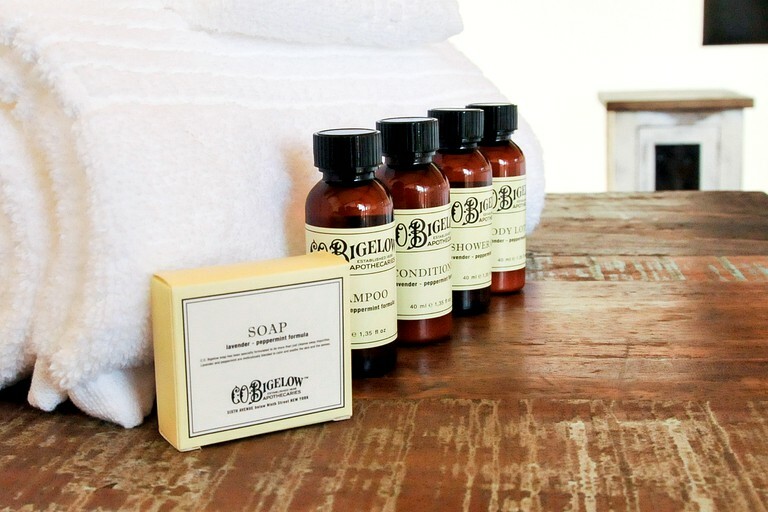 The bathroom facilities are pristine and guests renting the tent cabins have access to these. The showers are set on a timer to conserve water in the desert, however, guests are welcome to reset the timer if they would like a longer shower. 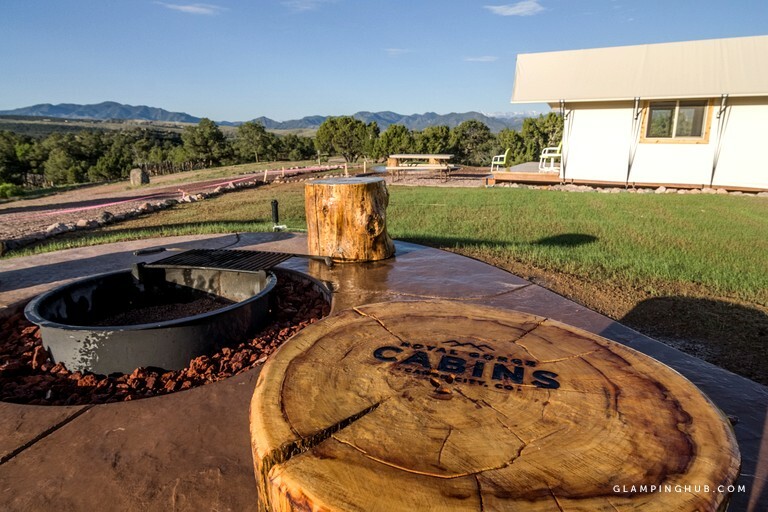 The private patio boasts outdoor patio furniture and just beyond the deck guests can roast marshmallows around the fire ring or marvel at the twinkling Colorado sky. 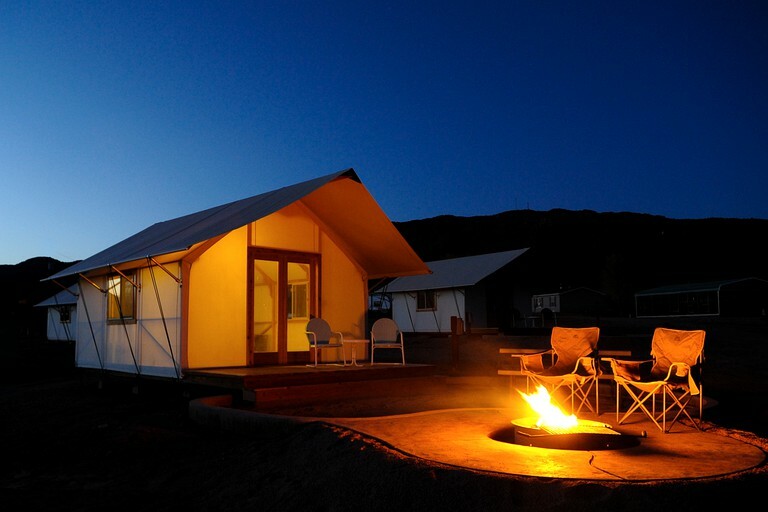 Glampers will be in for a unique camping experience with these tent cabins. 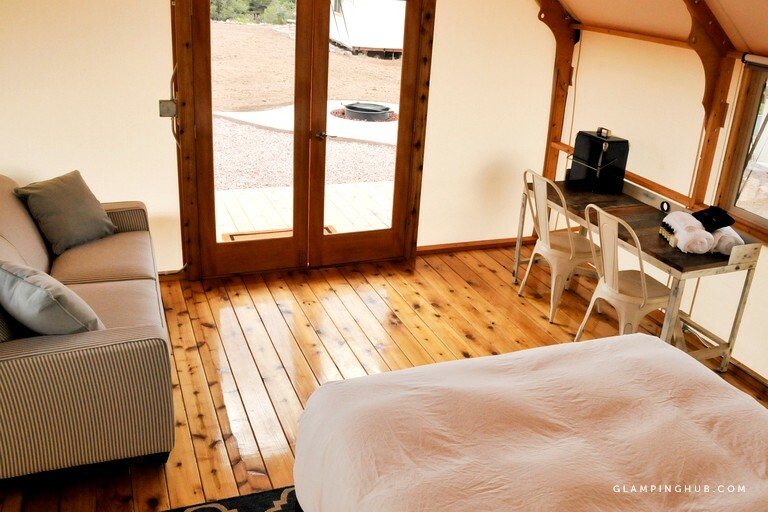 This exceptionally unique glamping site offers luxury facilities and amenities, which allow for a comfortable getaway with direct access to dramatic landscape and an abundance of outdoor activities. There are coin-operated washing machines on-site, a dump station, propane refill, a gift shop, a restaurant and bar, and snacks and firewood can be purchased at the registration office. 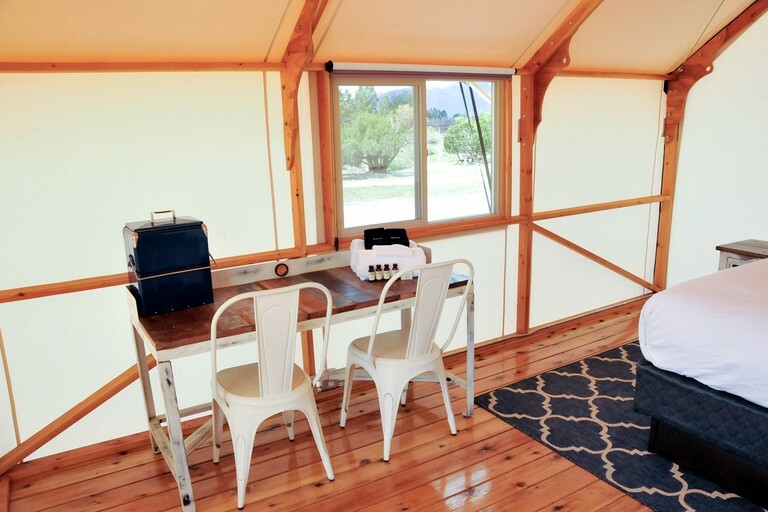 Guests will certainly have everything they need while glamping in southern Colorado. With abundant outdoor recreation opportunities, vast landscape, the jagged Rocky Mountains, and the pristine waters of the Arkansas River and the Royal Gorge, southern Colorado makes for an adventurous getaway destination. Guests can take scenic train rides with the Royal Gorge Route Railroad, go whitewater rafting on the Royal Gorge, tantalize their taste buds with some wine tasting at the Winery at Holy Cross Abbey or the incredible local cuisine in downtown Canon City, or visit one of the world’s highest suspension bridges at the Royal Gorge Bridge and Park. No pets are permitted in the cabins or glamping tents, however, there is a pet boarding facility a mile from the cabins. Smoking is not permitted within 25 miles of the cabins, and there is a $250 fine for violating this policy. There is a $14 resort fee at this property.